Each Monday morning, Eastlake Elementary students have something to look forward to — the Dragon Leader News Broadcast. During the 10-minute morning live broadcast, sixth-grade students who are part of the student council talk about events for the week. “There are sign-ups on our leadership board for kindergartners through sixth-grade. It’s part of the lighthouse team that leads the school through many responsibilities. It’s a way for students to learn what is happening and give real-world experience by sitting up tall, being confident, looking into the camera and smiling and reading from a teleprompter,” she said. 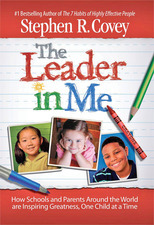 The Leader in Me program was developed by Sean Covey’s “Seven Habits of Happy Kids.” There are 21 schools in Jordan School District that have the program in place and many schools take one month to focus on a trait: Be Proactive; Begin with the End in Mind; Put First Things First; Think Win-Win; Seek First to Understand, Then to Be Understood; Synergize; and Sharpen the Saw, where students learn the importance of eating right, exercise, sleep and spending time with family and friends. Eastlake has hosted many national and international visitors who have toured the school where there could see Leader in Me goals and students’ progress displayed on the bulletin boards. Students, who are empowered with their own learning, have shared their leadership notebooks that show individual goals and how they planned to accomplish them by a set date. “The broadcast gives our students the opportunity to be leaders and learn public speaking skills, self-confidence and communication. We’re celebrating student learning and achievement,” Tingey said.